Comments: Here we see Seth the WWE Champion and we are given a look behind the ring. What happens backstage before they come on TV or in the ring. Seth and Roman mix it up a little and the scenes are action packed. We are treated to a few more scenes of Seth in the ring with other main event stars. 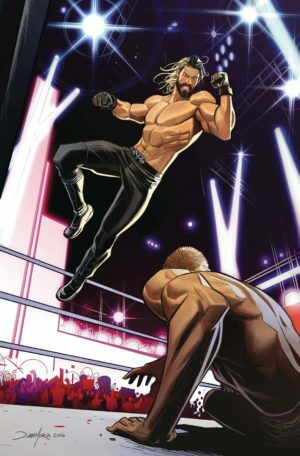 This issue though does focus on the business side and out of the ring events. Promoting each wrestler does it and the more famous and popular you are the more you are expected to do. The Champion is expected to do so the most. It is as much or more a part of wrestling as the actual wrestling. The Seth vs Brock match is action packed. Plus the Undertaker is drawn in one amazing scene. It is made clear here that being the WWE Champ is one tough job in or out of the ring. This issue does bring across the downside to being Champ. The wrestlers are portrayed here so wonderfully it is like you are seeing them in person. “The Warrior’s Path”The backup story gives a brief look at the Ultimate warrior. He is illustrated amazingly as a warrior ready to fight.